Stir Fry: 3 tbsp Stir Fry Sauce + 6 tbsp water to make a stir fry for 2 people using around 5 cups of uncooked ingredients (proteins + vegetables). 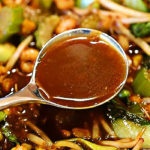 By weight (Noodles & Stir Fry): Around 3 tbsp Stir Fry Sauce per 1 lb / 500g of combined ingredients (proteins + vegetables + noodles if using) plus ⅓ cup water. Store it in the fridge in a jar for when you need it - just make sure to leave sufficient headroom in the jar so you can give it a good shake before using. 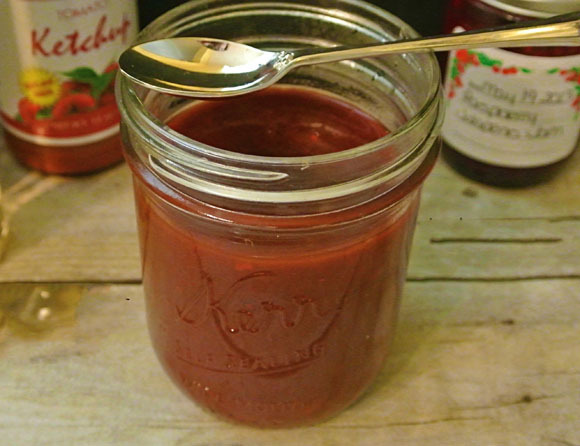 This makes 1½ cups of sauce which is enough for around 12 servings. 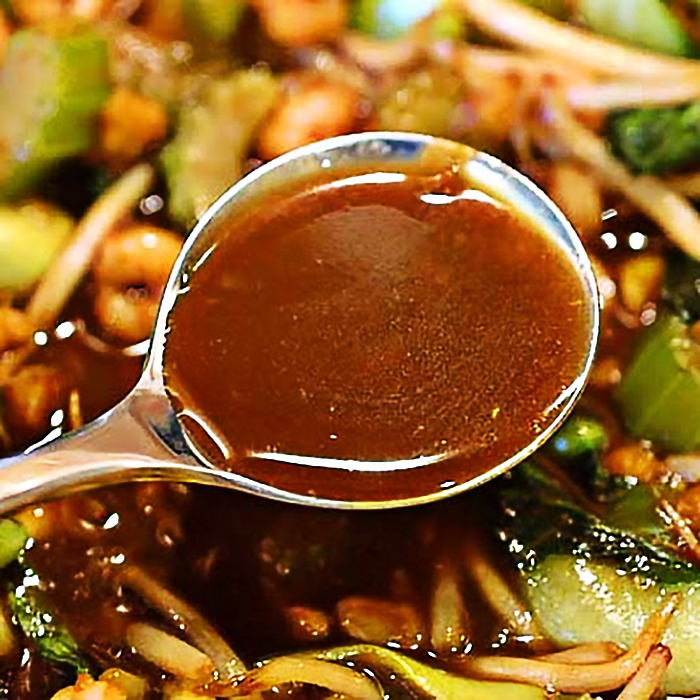 To make this sauce vegan, substitute the oyster sauce with hoisin sauce. This gives the sauce a slight Chinese Five Spice Powder flavour which is thoroughly authentic! This will last for weeks and weeks, depending on the expiry date of the ingredients you use. There is nothing in this that will go "off", so just check the expiry date of the ingredients you use in this, at use that as a guide. Chinese wine is a key ingredient in this. Best next substitute is dry sherry and after that Japanese cooking sake. Chinese Cooking Wine substitute - the cooking wine plays an important part in giving this sauce an extra depth of flavour that elevates it from "just a sauce" to a "real Chinese" sauce. However, for those who cannot have alcohol (and please remember, apple juice or grape juice is the best substitute. Otherwise, chicken broth/stock, as the second fall back, with 2 teaspoons of white wine vinegar + ½ Tsp sugar. 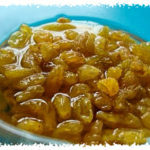 Combine cider and raisins in bowl and microwave until steaming, 1 to 2 minutes. Cover and let stand until plump, about 10 minutes. Strain cider through a fine-mesh strainer into a medium saucepan, reserving raisins. Add ½ cup vinegar, thyme sprigs, and shallots to cider and bring to boil over high heat. Reduce heat to medium-high and reduce mixture until it measures ¾ cup, 14 to 16 minutes. Add cream and reduce again to ¾ cup, about 5 minutes. Discard thyme sprigs. Off heat, whisk in butter, few pieces at a time, until fully incorporated. 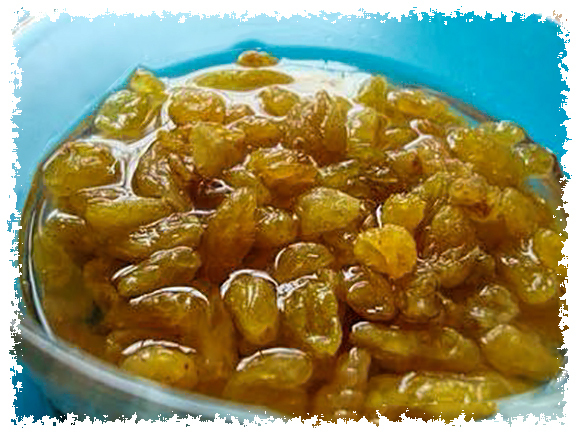 Stir in raisins, remaining 2 teaspoons vinegar, minced thyme, Calvados, salt, and pepper. Cover pan and hold, off heat, until serving. Alternatively, let the sauce cool completely and refrigerate for up to 2 days. Reheat in a small saucepan over medium-low heat, frequently stirring, until warm. 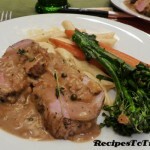 • The sauce can be prepared in advance of use of up to two days. • The preparation is equally simple: Just whisk cold butter into the reduced acidic liquid. 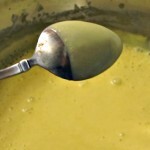 Butter sauces, like any mixture of fat and water, don't always stay emulsified. That's because the butter is temperature sensitive: If the sauce gets too hot (above 135), the butter will "break" and the butterfat will leak out. If it gets too cold (below 85), the butterfat solidifies and forms crystals that clump together and separate when the sauce is reheated. • The key to fool proofing a butter sauce is stabilizing the butterfat so that it doesn't separate. We do this by whisking in the butter a little bit at a time, which keeps the temperature of the sauce relatively stable. Even more important, we also add cream. The cream contains a relatively high proportion of casein proteins that surround and stabilize the butterfat droplets so that they don't separate from the emulsion. The cream is such an effective stabilizer that our sauce can be made ahead, chilled, and gently reheated before serving. So, worth the effort to make this sauce! Delicous, has a nice balance of sweet and sour with a little savory edge. Great with Duck or Pork. 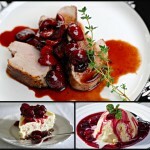 Combine port and cherries in bowl and microwave until steaming, 1 to 2 minutes. Cover and let stand until plump, about 10 minutes. 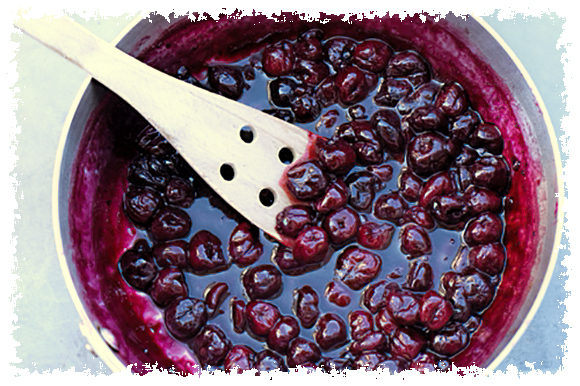 Strain port through a fine-mesh strainer into a medium saucepan, reserving cherries. Add vinegar, thyme sprigs, and shallots to port and bring to boil over high heat. Reduce heat to medium-high and reduce mixture until it measures ¾ cup, 14 to 16 minutes. Add cream and reduce again to ¾ cup, about 5 minutes. Discard thyme sprigs. Off heat, whisk in butter, few pieces at a time, until fully incorporated. 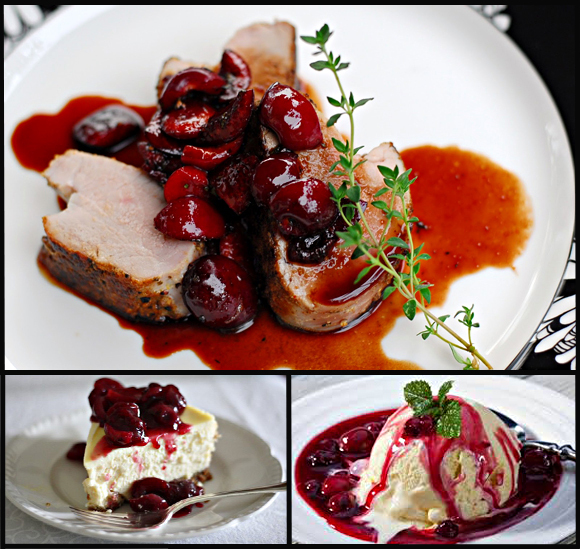 Stir in cherries, minced thyme, salt, and pepper. Cover pan and hold, off heat, until serving. Alternatively, let the sauce cool completely and refrigerate for up to 2 days. Reheat in a small saucepan over medium-low heat, frequently stirring, until warm. Pit the cherries with a sharp paring knife. To do this, simply cut to the pit all around the center of the long direction. Pull the halves apart and cut the pit out of the side that it sticks to. Put all the ingredients in a small pot. Bring to a boil, reduce heat to simmer and cook until syrupy, about 20 minutes. 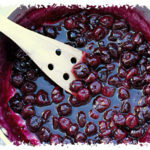 Don't overcook as that will result in the cherries softening too much. As it cools the sauce will thicken up further. While cream is heating, whisk together egg yolks and sugar until smooth. Slowly pour ½ cup of hot milk mixture into egg yolks, whisking constantly. 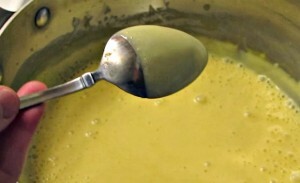 Gradually add egg yolk mixture back to remaining milk mixture, whisking constantly. Add the Bailey’s half way through the reduction. Continue to cook, stirring constantly, until the mixture coats the back of a spoon. 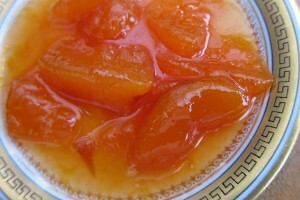 Peaches poached in white wine what could be better. 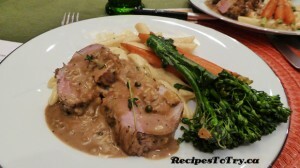 The sweet and sour elements found in this sauce compliment a roast pork to the nth degree. 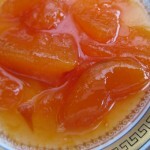 Bring peaches, wine, granulated sugar, ¼ cup vinegar, and thyme to simmer in small saucepan; cook, stirring occasionally, until reduced to 2 cups, about 30 minutes. Stir in remaining tablespoon vinegar and mustard. Remove thyme, and serve warm. 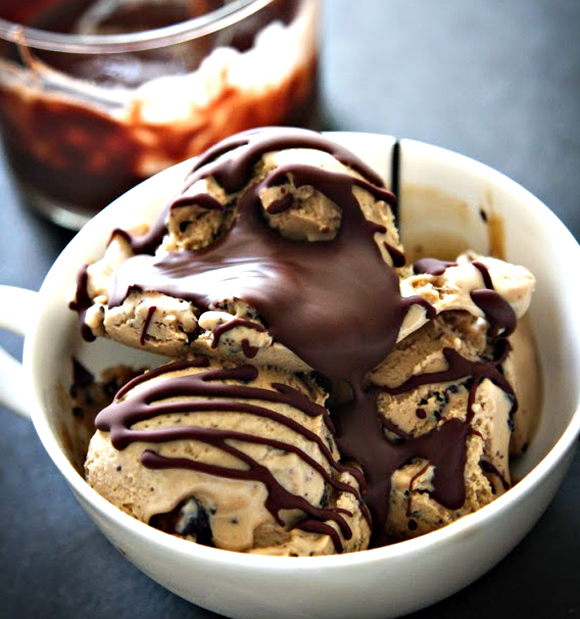 Chocolate Sauce that makes a Hard Chocolate Shell. Microwave at 50 percent power until smooth (two to four minutes), stirring occasionally. 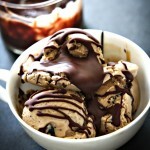 Cool to room temperature and spoon or pour over ice cream. If after storing it is not liquid enough 5 to 10 seconds in the microwave will make it pourable again. The secret to a hard chocolate shell: Coconut Oil. Solid at room temperature and brittle at cooler temperatures, this versatile ingredient makes the ice cream shop chocolate shell possible. 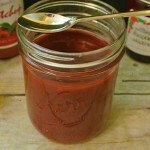 Combine red pepper jelly, apple sauce (optional), ketchup and Worcestershire sauce in microwave safe bowl. Microwave at HIGH (100%) power for 1 to 2 minutes until bubbling, stirring once. 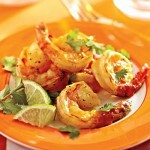 Shrimp dusted with Madras Curry... in an Exotic Mango and Ginger Sauce. Delicious on Pasta or Rice.
) Heat the oil in a medium non-stick saucepan over medium-high heat. Add the onion, ginger, cayenne, and remaining ¼ tsp salt; cook, stirring frequently, until lightly browned, about 3 mins. Add the mango puree and bring to a boil, stirring occasionally. Reduce the heat and simmer about 1 min. Pour the sauce into a sauce boat.
) Spray a large non-stick skillet with non-stick spray and set over medium-high heat. 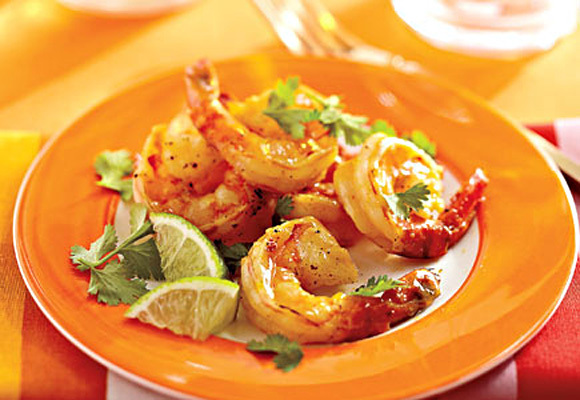 Add the shrimp and cook until just opaque in the center, about 2 minutes on each side. Transfer to a platter and sprinkle with the cilantro. Serve with the sauce.